It’s a night like any other on board the Icarus. Then, catastrophe strikes: the massive luxury spaceliner is yanked out of hyperspace and plummets to the nearest planet. Lilac LaRoux and Tarver Merendsen survive. And they seem to be alone. Lilac is the daughter of the richest man in the universe. Tarver comes from nothing, a young war hero who learned long ago that girls like Lilac are more trouble than they’re worth. But with only each other to rely on, Lilac and Tarver must work together, making a tortuous journey across the eerie, deserted terrain to seek help. Then, against all odds, Lilac and Tarver find a strange blessing in the tragedy that has thrown them into each other’s arms. Without the hope of a future together in their own world, they begin to wonder - would they be better off staying in this place forever? 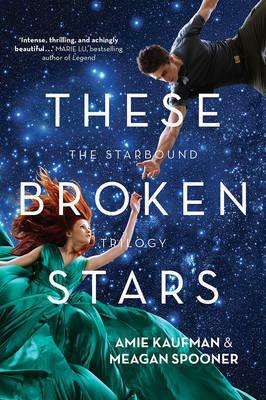 This first book in the Starbound trilogy – aptly described by the publisher as Titanic in space – reads like a star-crossed lovers’ tale but it’s so much more: a compelling, richly imagined adventure, intriguing at every turn and with a thrilling climax. Tarver and Lilac – two young people from completely different backgrounds – are forced together when the luxury spaceship Icarus crashes on a bizarre planet, leaving them the only survivors. Their struggle to survive the extraordinary conditions on this strange world is hindered by the difficulties in their relationship, especially their preconceptions of each other – he thinks she is a pampered, vain rich girl; she thinks he’s a boorish, poorly-educated army buffoon. Their adventure unfolds through both perspectives (told in alternate chapters), drawing the reader deeper into their ordeal. But for all their grief, fears and misunderstandings the two develop respect for other’s talents and ultimately love blossoms. Athina Clarke is a Children’s & YA Book Specialist at Readings Malvern.